Researchers recently tested for signs of chemical toxins in 24 women participating in their study. They found evidence of toxins in the bodies of every single woman. What was the source of these chemicals? Nail polish. 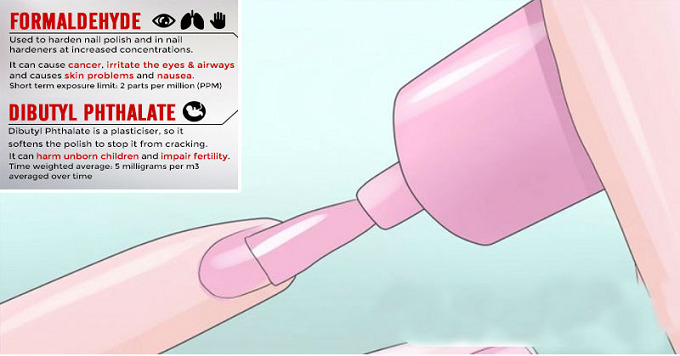 The results showed that 100% of the participants showed signs of triphenyl phosphate only 10 hours after applying nail polish. This type of conclusive result is remarkable, and it's also alarming. In a follow up study, the same researchers tested 10 different nail polishes for triphenyl phosphate, and discovered the chemical in 8. Two of those polishes that tested positively for the chemical did not disclose it on their product label. This could mean that up to 20% of nail polishes sold in our country contain a dangerous chemical that isn't listed as an ingredient. Formaldehyde. Formaldehyde is a well known carcinogen that can dissolve in water and in air (you know that strong nail polish smell?). Exposure to this chemical can also produce symptoms like a scratchy throat, asthma, and difficulty breathing. Those with chronic diseases are especially susceptible to poisoning from formaldehyde. Dibutyl Phthalate. Some nail polish brands swap this phthalate for TPHP, but it's no better for your health. In fact, it poses similar health risks such as hormonal disruption and reproductive system toxins. Luckily, there are some companies who decided to respond to the discoveries of dangerous nail polish ingredients. There are a handful of awesome, natural alternatives that don't contain the same risks of allergies, cancer, and hormone disruption. Here are some of our favorite options that offer a great selection at great prices! Acquarella has a selection of over 50+ nail polish colors. These are all water-based, and don't contain any formaldehyde, toluene, dibutyl phthalate, mercury, or wheat products. SpaRitual is a toxin-free brand of nail polish that is also totally vegan! Peacekeeper Cause-Metics also has a few bright nail polishes that are infused with argan oil, as well as being toxin-free. This one's a great way to make a classic color keep your nails moisturized. Your mani-pedi should be a fun way to express yourself, and not a threat to your health, or the health of your growing children. But it's easy to make the switch to health-conscious nail polish without compromising your wallet OR your sense of style!